What? No Chucko? Come on! no no no, silly.... chuckles will be filling in for a bunch of injured guys on the big club, where he'll score a million points just to spite us all. I can't wait to see these guys in A-town while sporting my best yellow shirt (we need to sit down and look at a schedule). 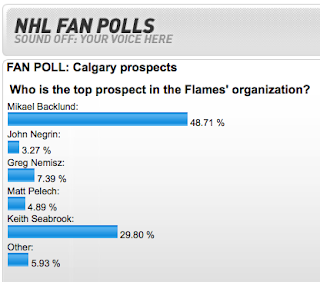 Backlund would have to be the pick; I guess Grantham isn't good enough to rank a slot in the polls (unless he changed his name to "other"). I'm also wondering what will happen this season when the Flames get on HNIC and we have a "face off" between PJ and Sjostrom. I have this image of you losing touch with reality and curling your toes right there in front of the TV. Seabrook is a freshly graduated Hitman (Hitmen player? grammar? ), no? That's the only reasonable explanation.